Liczba stron: 215 Jest to ujednolicona liczba stron, która ułatwi Ci porównanie długości książek. Każda strona Legimi to 200 słów. Regarded as the first full-length locked room mystery, The Big Bow Mystery focuses on a murder that has occurred inside a locked room, with no clear indication as to the weapon used, the perpetrator of the horrendous crime, or a possible escape route. Scotland Yard is stumped. Yet the seemingly unsolvable case has, as Inspector Grodman says, "one sublimely simple solution" that is revealed in a final chapter full of revelations and a shocking denouement. 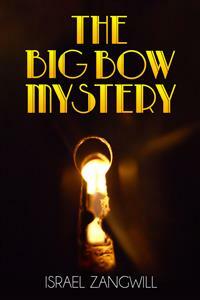 The Big Bow Mystery by Israel Zangwill. First published in 1892. This edition published 2017 by Enhanced Media Publishing. All rights reserved. Sir: Now that "The Big Bow Mystery" is solved to the satisfaction of at least one person, will you allow that person the use of your invaluable columns to enable him to thank the hundreds of your readers who have favored him with their kind suggestions and solutions while his tale was running and they were reading? I ask this more especially because great credit is due to them for enabling me to end the story in a manner so satisfactory to myself. When I started it, I had, of course, no idea who had done the murder, but I was determined no one should guess it. Accordingly, as each correspondent sent in the name of a suspect, I determined he or she should not be the guilty party. By degrees every one of the characters got ticked off as innocent—all except one, and I had no option but to make that character the murderer. I was very sorry to do this, as I rather liked that particular person, but when one has such ingenious readers, what can one do? You can't let anybody boast that he guessed aright, and, in spite of the trouble of altering the plot five or six times, I feel that I have chosen the course most consistent with the dignity of my profession. Had I not been impelled by this consideration I should certainly have brought in a verdict against Mrs. Drabdump, as recommended by the reader who said that, judging by the illustration in the "Star," she must be at least seven feet high, and, therefore, could easily have got on the roof and put her (proportionately) long arm down the chimney to effect the cut. I am not responsible for the artist's conception of the character. When I last saw the good lady she was under six feet, but your artist may have had later information. The "Star" is always so frightfully up to date. I ought not to omit the humorous remark of a correspondent, who said: "Mortlake might have swung in some wild way from one window to another, at any rate in a story." I hope my fellow-writers thus satirically prodded will not demand his name, as I object to murders, "at any rate in real life." Finally, a word with the legions who have taken me to task for allowing Mr. Gladstone to write over 170 words on a postcard. It is all owing to you, sir, who announced my story as containing humorous elements. I tried to put in some, and this gentle dig at the grand old correspondent's habits was intended to be one of them. However, if I am to be taken "at the foot of the letter" (or rather of the postcard), I must say that only to-day I received a postcard containing about 250 words. But this was not from Mr. Gladstone. At any rate, till Mr. Gladstone himself repudiates this postcard, I shall consider myself justified in allowing it to stand in the book. Again thanking your readers for their valuable assistance, Yours, etc. One would have imagined that nobody could take this seriously, for it is obvious that the mystery-story is just the one species of story that can not be told impromptu or altered at the last moment, seeing that it demands the most careful piecing together and the most elaborate dove-tailing. Nevertheless, if you cast your joke upon the waters, you shall find it no joke after many days. This is what I read in the Lyttelton Times, New Zealand: "The chain of circumstantial evidence seems fairly irrefragable. From all accounts, Mr. Zangwill himself was puzzled, after carefully forging every link, how to break it. The method ultimately adopted I consider more ingenious than convincing." After that I made up my mind never to joke again, but this good intention now helps to pave the beaten path. The Mystery which the author will always associate with this story is how he got through the task of writing it. It was written in a fortnight—day by day—to meet a sudden demand from the "Star," which made "a new departure" with it. The said fortnight was further disturbed by an extraordinary combined attack of other troubles and tasks. This is no excuse for the shortcomings of the book, as it was always open to the writer to revise or suppress it. The latter function may safely be left to the public, while if the work stands—almost to a letter—as it appeared in the "Star," it is because the author cannot tell a story more than once. The introduction of Mr. Gladstone into a fictitious scene is defended on the ground that he is largely mythical. On a memorable morning of early December London opened its eyes on a frigid gray mist. There are mornings when King Fog masses his molecules of carbon in serried squadrons in the city, while he scatters them tenuously in the suburbs; so that your morning train may bear you from twilight to darkness. But to-day the enemy's maneuvering was more monotonous. From Bow even unto Hammersmith there draggled a dull, wretched vapor, like the wraith of an impecunious suicide come into a fortune immediately after the fatal deed. The barometers and thermometers had sympathetically shared its depression, and their spirits (when they had any) were low. The cold cut like a many-bladed knife. Mrs. Drabdump, of 11 Glover Street, Bow, was one of the few persons in London whom fog did not depress. She went about her work quite as cheerlessly as usual. She had been among the earliest to be aware of the enemy's advent, picking out the strands of fog from the coils of darkness the moment she rolled up her bedroom blind and unveiled the somber picture of the winter morning. She knew that the fog had come to stay for the day at least, and that the gas bill for the quarter was going to beat the record in high-jumping. She also knew that this was because she had allowed her new gentleman lodger, Mr. Arthur Constant, to pay a fixed sum of a shilling a week for gas, instead of charging him a proportion of the actual account for the whole house. The meteorologists might have saved the credit of their science if they had reckoned with Mrs. Drabdump's next gas bill when they predicted the weather and made "Snow" the favorite, and said that "Fog" would be nowhere. Fog was everywhere, yet Mrs. Drabdump took no credit to herself for her prescience. Mrs. Drabdump indeed took no credit for anything, paying her way along doggedly, and struggling through life like a wearied swimmer trying to touch the horizon. That things always went as badly as she had foreseen did not exhilarate her in the least. Mrs. Drabdump was a widow. Widows are not born, but made, else you might have fancied Mrs. Drabdump had always been a widow. Nature had given her that tall, spare form, and that pale, thin-lipped, elongated, hard-eyed visage, and that painfully precise hair, which are always associated with widowhood in low life. It is only in higher circles that women can lose their husbands and yet remain bewitching. The late Mr. Drabdump had scratched the base of his thumb with a rusty nail, and Mrs. Drabdump's foreboding that he would die of lockjaw had not prevented her wrestling day and night with the shadow of Death, as she had wrestled with it vainly twice before, when Katie died of diphtheria and little Johnny of scarlet fever. Perhaps it is from overwork among the poor that Death has been reduced to a shadow. Mrs. Drabdump was lighting the kitchen fire. She did it very scientifically, as knowing the contrariety of coal and the anxiety of flaming sticks to end in smoke unless rigidly kept up to the mark. Science was a success as usual; and Mrs. Drabdump rose from her knees content, like a Parsee priestess who had duly paid her morning devotions to her deity. Then she started violently, and nearly lost her balance. Her eye had caught the hands of the clock on the mantel. They pointed to fifteen minutes to seven. Mrs. Drabdump's devotion to the kitchen fire invariably terminated at fifteen minutes past six. What was the matter with the clock? Mrs. Drabdump had an immediate vision of Snoppet, the neighboring horologist, keeping the clock in hand for weeks and then returning it only superficially repaired and secretly injured more vitally "for the good of the trade." The evil vision vanished as quickly as it came, exorcised by the deep boom of St. Dunstan's bells chiming the three-quarters. In its place a great horror surged. Instinct had failed; Mrs. Drabdump had risen at half-past six instead of six. Now she understood why she had been feeling so dazed and strange and sleepy. She had overslept herself. Chagrined and puzzled, she hastily set the kettle over the crackling coal, discovering a second later that she had overslept herself because Mr. Constant wished to be woke three-quarters of an hour earlier than usual, and to have his breakfast at seven, having to speak at an early meeting of discontented tram-men. She ran at once, candle in hand, to his bedroom. It was upstairs. All "upstairs" was Arthur Constant's domain, for it consisted of but two mutually independent rooms. Mrs. Drabdump knocked viciously at the door of the one he used for a bedroom, crying, "Seven o'clock, sir. You'll be late, sir. You must get up at once." The usual slumbrous "All right" was not forthcoming; but, as she herself had varied her morning salute, her ear was less expectant of the echo. She went downstairs, with no foreboding save that the kettle would come off second best in the race between its boiling and her lodger's dressing. For she knew there was no fear of Arthur Constant's lying deaf to the call of duty—temporarily represented by Mrs. Drabdump. He was a light sleeper, and the tram conductors' bells were probably ringing in his ears, summoning him to the meeting. Why Arthur Constant, B. A.—white-handed and white-shirted, and gentleman to the very purse of him—should concern himself with tram-men, when fortune had confined his necessary relations with drivers to cabmen at the least, Mrs. Drabdump could not quite make out. He probably aspired to represent Bow in Parliament; but then it would surely have been wiser to lodge with a landlady who possessed a vote by having a husband alive. Nor was there much practical wisdom in his wish to black his own boots (an occupation in which he shone but little), and to live in every way like a Bow working man. Bow working men were not so lavish in their patronage of water, whether existing in drinking glasses, morning tubs, or laundress' establishments. Nor did they eat the delicacies with which Mrs. Drabdump supplied him, with the assurance that they were the artisan's appanage. She could not bear to see him eat things unbefitting his station. Arthur Constant opened his mouth and ate what his landlady gave him, not first deliberately shutting his eyes according to the formula, the rather pluming himself on keeping them very wide open. But it is difficult for saints to see through their own halos; and in practice an aureola about the head is often indistinguishable from a mist. The tea to be scalded in Mr. Constant's pot, when that cantankerous kettle should boil, was not the coarse mixture of black and green sacred to herself and Mr. Mortlake, of whom the thoughts of breakfast now reminded her. Poor Mr. Mortlake, gone off without any to Devonport, somewhere about four in the fog-thickened darkness of a winter night! Well, she hoped his journey would be duly rewarded, that his perks would be heavy, and that he would make as good a thing out of the "traveling expenses" as rival labor leaders roundly accused him of to other people's faces. She did not grudge him his gains, nor was it her business if, as they alleged, in introducing Mr. Constant to her vacant rooms, his idea was not merely to benefit his landlady. He had done her an uncommon good turn, queer as was the lodger thus introduced. His own apostleship to the sons of toil gave Mrs. Drabdump no twinges of perplexity. Tom Mortlake had been a compositor; and apostleship was obviously a profession better paid and of a higher social status. Tom Mortlake—the hero of a hundred strikes—set up in print on a poster, was unmistakably superior to Tom Mortlake setting up other men's names at a case. Still, the work was not all beer and skittles, and Mrs. Drabdump felt that Tom's latest job was not enviable. She shook his door as she passed it on her way to the kitchen, but there was no response. The street door was only a few feet off down the passage, and a glance at it dispelled the last hope that Tom had abandoned the journey. The door was unbolted and unchained, and the only security was the latch-key lock. Mrs. Drabdump felt a whit uneasy, though, to give her her due, she never suffered as much as most housewives do from criminals who never come. Not quite opposite, but still only a few doors off, on the other side of the street, lived the celebrated ex-detective, Grodman, and, illogically enough, his presence in the street gave Mrs. Drabdump a curious sense of security, as of a believer living under the shadow of the fane. That any human being of ill-odor should consciously come within a mile of the scent of so famous a sleuth-hound seemed to her highly improbable. Grodman had retired (with a competence) and was only a sleeping dog now; still, even criminals would have sense enough to let him lie. So Mrs. Drabdump did not really feel that there had been any danger, especially as a second glance at the street door showed that Mortlake had been thoughtful enough to slip the loop that held back the bolt of the big lock. She allowed herself another throb of sympathy for the labor leader whirling on his dreary way toward Devonport Dockyard. Not that he had told her anything of his journey beyond the town; but she knew Devonport had a Dockyard because Jessie Dymond—Tom's sweetheart—once mentioned that her aunt lived near there, and it lay on the surface that Tom had gone to help the dockers, who were imitating their London brethren. Mrs. Drabdump did not need to be told things to be aware of them. She went back to prepare Mr. Constant's superfine tea, vaguely wondering why people were so discontented nowadays. But when she brought up the tea and the toast and the eggs to Mr. Constant's sitting-room (which adjoined his bedroom, though without communicating with it), Mr. Constant was not sitting in it. She lit the gas, and laid the cloth; then she returned to the landing and beat at the bedroom door with an imperative palm. Silence alone answered her. She called him by name and told him the hour, but hers was the only voice she heard, and it sounded strangely to her in the shadows of the staircase. Then, muttering, "Poor gentleman, he had the toothache last night; and p'r'aps he's only just got a wink o' sleep. Pity to disturb him for the sake of them grizzling conductors. I'll let him sleep his usual time," she bore the tea-pot downstairs with a mournful, almost poetic, consciousness, that soft-boiled eggs (like love) must grow cold. Half-past seven came—and she knocked again. But Constant slept on. His letters, always a strange assortment, arrived at eight, and a telegram came soon after. Mrs. Drabdump rattled his door, shouted, and at last put the wire under it. Her heart was beating fast enough now, though there seemed to be a cold, clammy snake curling round it. She went downstairs again and turned the handle of Mortlake's room, and went in without knowing why. The coverlet of the bed showed that the occupant had only lain down in his clothes, as if fearing to miss the early train. She had not for a moment expected to find him in the room; yet somehow the consciousness that she was alone in the house with the sleeping Constant seemed to flash for the first time upon her, and the clammy snake tightened its folds round her heart. She opened the street door, and her eye wandered nervously up and down. It was half-past eight. The little street stretched cold and still in the gray mist, blinking bleary eyes at either end, where the street lamps smoldered on. No one was visible for the moment, though smoke was rising from many of the chimneys to greet its sister mist. At the house of the detective across the way the blinds were still down and the shutters up. Yet the familiar, prosaic aspect of the street calmed her. The bleak air set her coughing; she slammed the door to, and returned to the kitchen to make fresh tea for Constant, who could only be in a deep sleep. But the canister trembled in her grasp. She did not know whether she dropped it or threw it down, but there was nothing in the hand that battered again a moment later at the bedroom door. No sound within answered the clamor without. She rained blow upon blow in a sort of spasm of frenzy, scarce remembering that her object was merely to wake her lodger, and almost staving in the lower panels with her kicks. Then she turned the handle and tried to open the door, but it was locked. The resistance recalled her to herself—she had a moment of shocked decency at the thought that she had been about to enter Constant's bedroom. Then the terror came over her afresh. She felt that she was alone in the house with a corpse. She sank to the floor, cowering; with difficulty stifling a desire to scream. Then she rose with a jerk and raced down the stairs without looking behind her, and threw open the door and ran out into the street, only pulling up with her hand violently agitating Grodman's door-knocker. In a moment the first floor window was raised—the little house was of the same pattern as her own—and Grodman's full, fleshy face loomed through the fog in sleepy irritation from under a nightcap. Despite its scowl the ex-detective's face dawned upon her like the sun upon an occupant of the haunted chamber. "What in the devil's the matter?" he growled. Grodman was not an early bird, now that he had no worms to catch. He could afford to despise proverbs now, for the house in which he lived was his, and he lived in it because several other houses in the street were also his, and it is well for the landlord to be about his own estate in Bow, where poachers often shoot the moon. Perhaps the desire to enjoy his greatness among his early cronies counted for something, too, for he had been born and bred at Bow, receiving when a youth his first engagement from the local police quarters, whence he drew a few shillings a week as an amateur detective in his leisure hours. Grodman was still a bachelor. In the celestial matrimonial bureau a partner might have been selected for him, but he had never been able to discover her. It was his one failure as a detective. He was a self-sufficing person, who preferred a gas stove to a domestic; but in deference to Glover Street opinion he admitted a female factotum between ten a. m. and ten p. m., and, equally in deference to Glover Street opinion, excluded her between ten p. m. and ten a. m.
"I want you to come across at once," Mrs. Drabdump gasped. "Something has happened to Mr. Constant." "What! Not bludgeoned by the police at the meeting this morning, I hope?" "No, no! He didn't go. He is dead." "Dead?" Grodman's face grew very serious now. "What?" almost shouted the ex-detective. "How? When? Where? Who?" "I don't know. I can't get to him. I have beaten at his door. He does not answer." Grodman's face lit up with relief. "You silly woman! Is that all? I shall have a cold in my head. Bitter weather. He's dog-tired after yesterday—processions, three speeches, kindergarten, lecture on 'the moon,' article on co-operation. That's his style." It was also Grodman's style. He never wasted words. "No," Mrs. Drabdump breathed up at him solemnly, "he's dead." "All right; go back. Don't alarm the neighborhood unnecessarily. Wait for me. Down in five minutes." Grodman did not take this Cassandra of the kitchen too seriously. Probably he knew his woman. His small, bead-like eyes glittered with an almost amused smile as he withdrew them from Mrs. Drabdump's ken, and shut down the sash with a bang. The poor woman ran back across the road and through her door, which she would not close behind her. It seemed to shut her in with the dead. She waited in the passage. After an age—seven minutes by any honest clock—Grodman made his appearance, looking as dressed as usual, but with unkempt hair and with disconsolate side-whisker. He was not quite used to that side-whisker yet, for it had only recently come within the margin of cultivation. In active service Grodman had been clean-shaven, like all members of the profession—for surely your detective is the most versatile of actors. Mrs. Drabdump closed the street door quietly, and pointed to the stairs, fear operating like a polite desire to give him precedence. Grodman ascended, amusement still glimmering in his eyes. Arrived on the landing he knocked peremptorily at the door, crying, "Nine o'clock, Mr. Constant; nine o'clock!" When he ceased there was no other sound or movement. His face grew more serious. He waited, then knocked, and cried louder. He turned the handle, but the door was fast. He tried to peer through the keyhole, but it was blocked. He shook the upper panels, but the door seemed bolted as well as locked. He stood still, his face set and rigid, for he liked and esteemed the man.